Spiegel & Grau, 9781400069125, 464pp. Grant Morrison is one of the most popular and acclaimed contemporary writers of any genre. His long list of credits as a comic-book writer include "JLA, New X-Men, Seven Soldiers, Animal Man, Doom Patrol, The Invisibles, We3, The Filth, "and "Batman: Arkham Asylum, "the bestselling original graphic novel of all time. He is also an award-winning playwright and screenwriter. 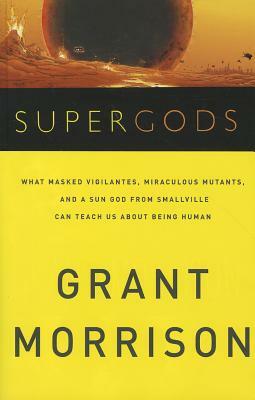 "Grant Morrison is the antimatter to the often mundane world of comics - SUPERGODS is the finely tuned death-ray. Far beyond deconstruction, it exposes, challenges, invigorates and detonates everything we know about this modern mythology. SUPERGODS gives meaning to the fictional worlds we create and live within and helps us make sense of the madness within ourselves through the four-color world of the super hero." --Gerard Way, lead singer of My Chemical Romance and author of The Umbrella Academy.